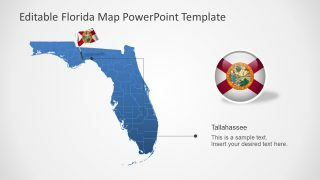 The Florida State PowerPoint Map Template is a set of slides presenting one state of America. 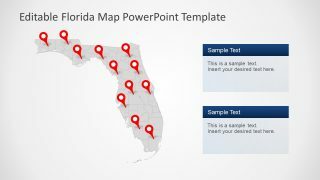 This is an editable PowerPoint map containing individual counties as clipart shapes. The state of Florida is the southeasternmost part of the USA between Atlantic and Gulf of Mexico. 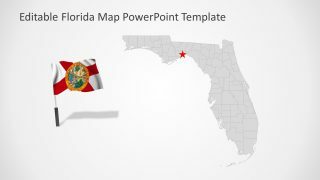 This template of Florida state can demonstrate a range of presentations which involve the discussion of geographical location. For instance, marking the office locations in multiple counties in Florida. Or, highlight the areas of a potential consumer market for business sales and marketing purposes. 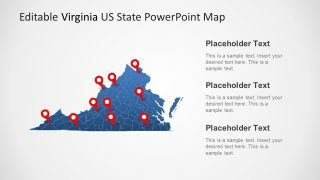 The presenter can use this template along with the US Map template of editable states available in SlideModel maps catalog. This way, they can make a compelling illustrating of focus-shift from America to one state and then specific county. 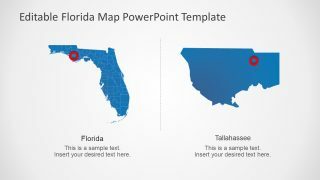 The latest Florida State PowerPoint Map Template has a blue and gray color theme. 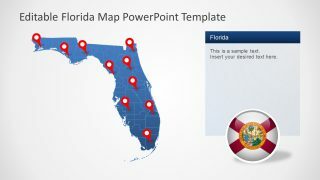 However, it is an editable PowerPoint map, enabling users to make changes in the color, shapes, size, or other effects. For example, altering the color can include different shape fills for every county as distinction option. 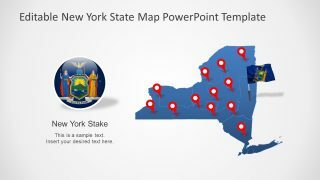 The map template contains 7 unique layout designs to choose from. 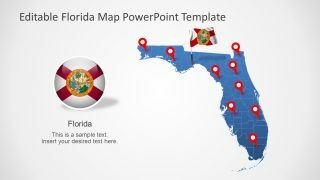 These include the slides with flag clipart, GPS location markers, zoom-in on state capital county Tallahassee, and Pensacola. 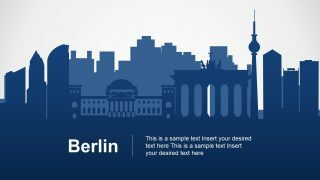 PowerPoint offers a creative set of clipart flags and GPS markers. Users can copy these icons and reuse to highlight different counties. 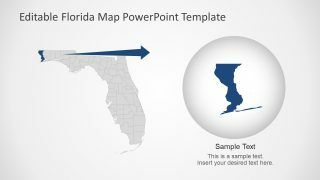 The PowerPoint map template for Florida state is a collection of flat vector shapes to present geographical data. These templates can also make an attractive tourism slideshow displaying beaches, and tourist attractions. 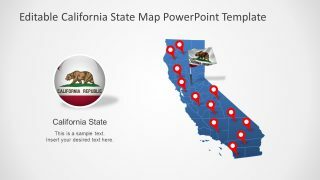 Moreover, the PowerPoint map presentation can assist in learning the geography of the US States. Each shape of Florida state map can easily be separated. This way, the users can rescale the shape of a county and change the colors either by adding gradients or picture. Similarly, they can add shadow, preset or 3D effects to the editable PowerPoint map from drawing format menu.